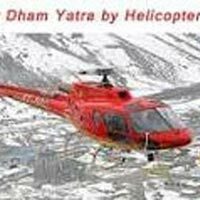 Chardham yatra tour packages by helicopter - Chardham Yatra is a holy yatra that every devoted Hindu wishes to embark on at least once in his or her lifetime. Considered to be one of the most revered religious treks of Hinduism, Chardham Yatra includes treks to four religious sites - Yamunotri, Gangotri, Kedarnath and Badrinath. Chardham Yatra Tour Packages by Helicopter offers you a chance to pay tribute to your lords and enjoy some refreshing moments, nestle in the lap of nature. Journey of Chardham is very arduous and lengthy by road. However, operation of Helicopter services for Chardham makes the journey to the whole Yatra, easier and short. Chardham tour package by helicopter starts from the west to east. So, your holy Yatra begins with Yamunotri, proceeds to Gangotri and then to Kedarnath and Badrinath. This chardham yatra package by helicopter not only allows you to have darshan at the four holy sites, but also offers sometime amid the tranquillity of the snow-capped Himalayas. While on a spiritual tour, people would prefer to travel with a peaceful mind and comfort. Our team of travel experts have designed Chardham Yatra Tour Packages by Helicopter suiting every traveller’s requirements. With a chardham tour packages by helicopter, you can be sure to have a memorable tour, where you can get a darshan of the Lord without any worries about travel and arrangements. The chardham yatra package by helicopter saves lot of time and energy, thereby offering you the eagle eye view of Himalayas during your holy visit. Our chardham yatra by helicopter has something for every preference and budget limit. Covering almost everything related to your travel, we ensure to provide you with a spiritual travel without any distractions and travel distress. Each of our packages has the best rates and offers variety of options to make your tour to Chardham yatra hassle-free. While travelling, go with pleasure as our char dham yatra tour packages by helicopter are tailored as per your requirements. Our char dham yatra package by helicopter offers a gratified stay at the hotels, by providing a judicious blend of services within the preferred budget. We provide the most affordable accommodation clubbed with all required needs. At Namita Travels, we strive towards making your holy yatra, an enriching and pleasing one. Thus, we at Namita Travels ensure that our customers have a wonderful experience at this holy place, with a pleasant stay, divine darshan and a relaxed sightseeing. Arrival at Harsil helipad Gangotri. We will organize transport from Harsil to GangotriTemple. you can enjoy the beautiful surroundings of Harsil including the pure and quiet Ganges river which passes from near the helipad. For early booking of Char Dham tour by helicopter 2017 please drop a mail or call us.